wall in the turn can be suitable solutions. 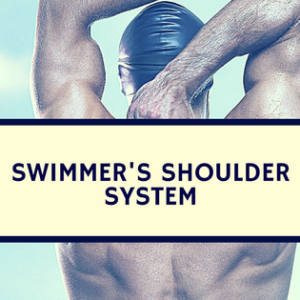 One of the greatest achievements expected by the swimming fraternity worldwide is the possibility of a time lower than 57s in the men’s 100m breaststroke event. 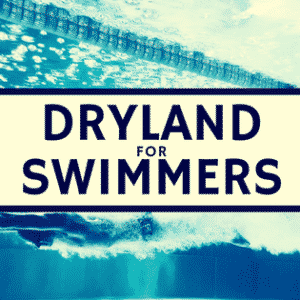 Adam Peaty has set eyes on this remarkable achievement and coined it as “Project-56”. Nevertheless, there are a few questions hanging: is an under-57 seconds time doable? If so, what should be the race strategy and where are the margins of improvement. 1. Is an under-57s race doable? 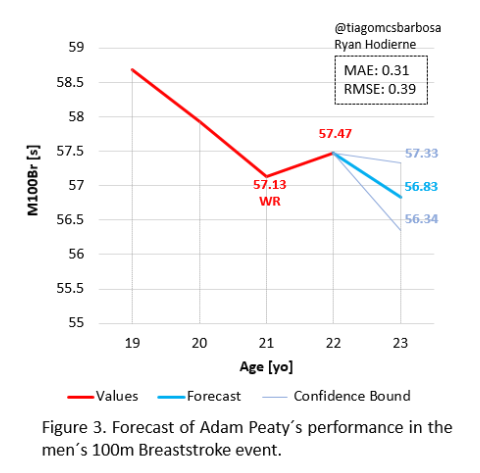 To answer this question we have tracked down Adam Peaty’s performances over his career and run a forecast of hypothetical race times in the near future. Is an under-57s race doable? Considering the trajectory of his performance and the forecast, a time under-57s is indeed doable. 2. How to race under-57s? To address this question we assessed Adam’s race strategy and set tentative target-times. How to race under-57s? 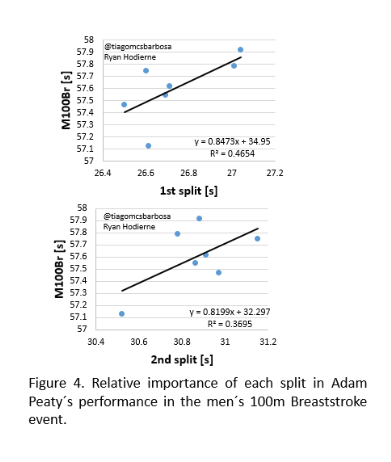 Changes in Peaty’s performance are strongly dependent on the first split. Only once he delivered a 30.5s in the second split. That said, he should consider racing in 26.4(30.5s) or 26.5(30.4). 3. Where do we find margin for improvements? To learn where he can shave some tenths of a second in the race and achieve the tentative target times noted early on, we did the analysis of selected races. The first split is advised to be done in 26.4s. This is almost the same time delivered at Budapest 2017 (26.50s). 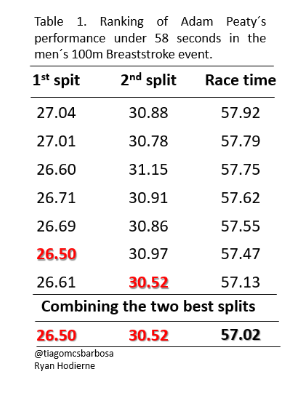 We have analyzed several races where he splits in 26.50-27.04. At Budapest 2017 the time at the 15m mark was 6.50s. Times at 25m, 35m, and 45m marks were 12.16, 17.80 and 23.86s, respectively. In his latest race, at the 2018 Commonwealth Games, the start (15m mark) took 6.56s. As a comparison, Cameron van der Burgh spent 6.08s at Kazan 2015 and 6.32 at the 2018 Commonwealth Games. Kevin Cordes reaches the 15m mark in 6.28s at Budapest 2017. Where do we find margin for improvements? An improvement of about 0.1-0.2s in the first 15m of the race and/or at least 0.05-0.1s out of the wall in the turn can be suitable solutions. We have learned that one strategy to improve the time going out is to enhance the start. What to improve in the start? We have provided our qualitative analysis below. 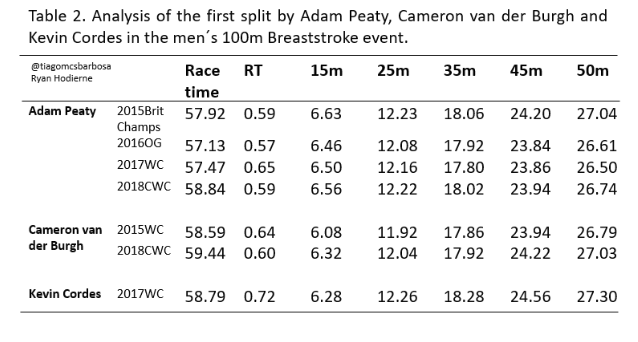 Taken from Peaty’s breaststroke leg, in the 4x100m Medley relay at Rio 2016, the 15m, 25m, and 50m splits were 6.34s, 11.94s, and 26.09s. What to do to improve the turn? Major improvements are advised in the pull-out, timing and coordination of break after start and turn. 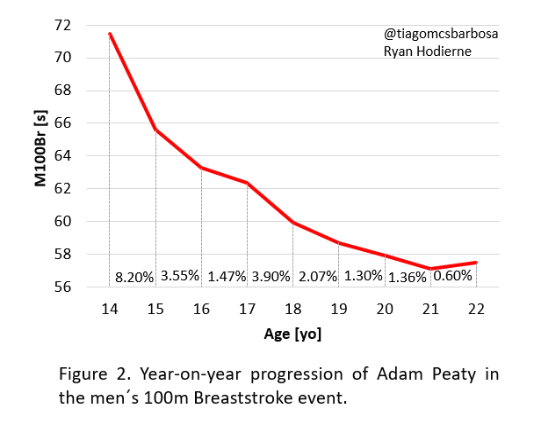 This is a customized analysis of Adam Peaty’s performances. 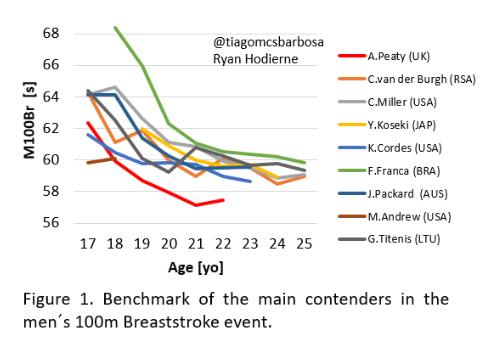 The key points given may be quite different for other swimmers aiming to break the 57s mark. 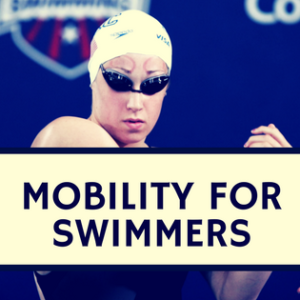 Written By: Tiago M. Barbosa PhD degree recipient in Sport Sciences and faculty at the Nanyang Technological University, Singapore and Ryan Hodierne Swimming Biomechanics, Race Performance Analyst.